I promised a while back, when discussing my new studio space, that once I had the space spiffied up a bit, I’d take and post some photos. The time has come. 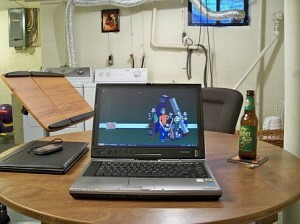 All who would care to bore themselves with a nauseatingly detailed tour of my workspace, please click! This entry was posted on Tuesday, September 8th, 2009 at 12:00 am and is filed under Blog. You can follow any responses to this entry through the RSS 2.0 feed. You can leave a response, or trackback from your own site.